BBQ Recipes For Your Next Upstate NY Camping Trip! Camping in Upstate NY during the summer means fun, sun, and BBQs! With the warm weather approaching just around the corner, the smell of outdoor cooking is in the air. Whether you’re camping in the Adirondacks and cooking for 2 or 20, barbecuing is a must. We’ve compiled a list of easy and simple recipes selected from some of the best chefs around. 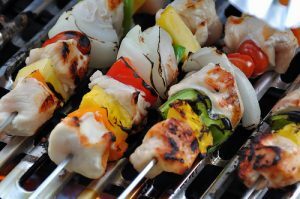 So, fire up your grill and get ready for some great summer food and fun! Rinse the chicken in cold water; pat dry with paper towels. Cut the chicken into 1-inch pieces and place the pieces in a large bowl. Marinade: In a small bowl, combine the yogurt, garlic, curry powder, ginger, chili powder, salt and cayenne pepper. Pour over the chicken, and turn the chicken pieces to coat. Cover and marinate in the refrigerator for 4 to 24 hours. Lemon Cilantro Dressing: In a small bowl, combine the lemon juice, cilantro, garlic, and salt. Whisk in the olive oil. Thread the chicken pieces onto skewers. Grill directly over medium-hot charcoals, or over medium-high heat on a gas grill for 8 to 12 minutes, or until chicken is tender and no pink remains, turning occasionally. Remove the chicken from skewers. Meanwhile, in a large bowl, combine the lettuce, tomato, and green onions. Toss with half of the Lemon Cilantro Dressing. Serve the chicken over the hot cooked rice with the salad. Spoon the remaining dressing over the chicken and rice. Garnish with fresh cilantro. Sprinkle the steaks liberally with salt and pepper. Bring the steaks to room temperature while you prepare your grill. Heat the grill so that one-half is hot and the other half is just warm. Lay the steaks on the hot half of the grill, and sear until well-browned, about 2 to 3 minutes. Turn, sear until well-browned, and move them to the warm side of the grill. Grill them 5 to 10 minutes longer, or until they’ve reached the desired doneness (120 degrees for rare, 135 degrees for medium). To gauge the temperature, insert a meat thermometer into the side of the meat rather than the top, being sure not to get close to any bones. 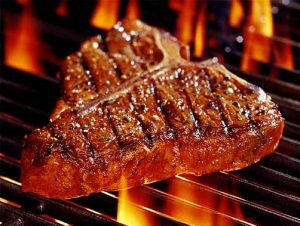 When the steaks have reached the right temperature, remove from the grill, tent with foil, and let rest for 3 to 5 minutes before serving. 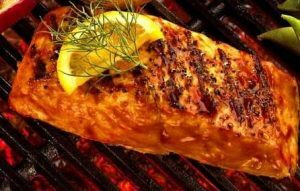 Place fish on grill over hot coals, cover, baste with sauce 2-3 times during cooking. When barbecuing filleted salmon, cook with skin on, skin side down and do not turn. Steaks may need to be turned. Grill until done, about 10-15 minutes. To test for doneness, place an instant reading thermometer in the thickest part of the flesh, 120 degrees is done. Or, flake apart, and when the flesh has lost transparency, it is done. Serve with additional barbecue sauce and lemon wedges. Leftovers are great in sandwiches, or blended with sour cream, mayonnaise and dill as a cracker dip.